Hillary Clinton and Bernie Sanders have had more than their share of disagreements throughout primary season. But many of those concerns about party unity vanished last night as Clinton and Sanders teamed up to pin a rabid coyote between their two cars. Yes! THIS is what a unified party looks like. 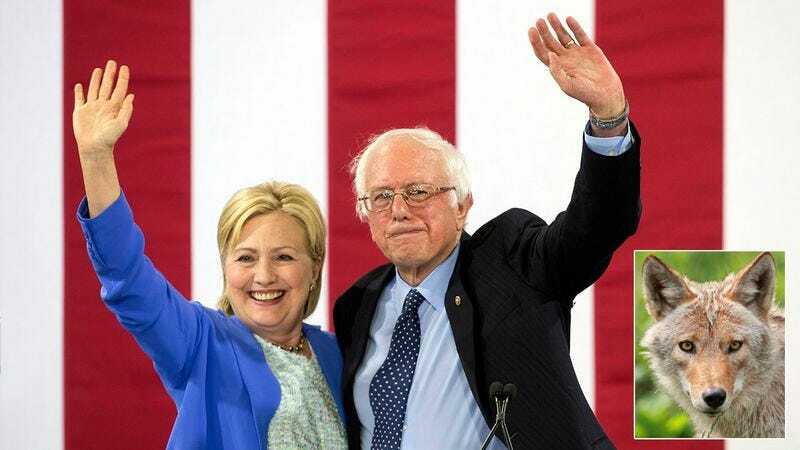 In a touching gesture, Bernie reached out to Hillary and had her meet him in her car at the parking lot of a local Walgreens, where the wild animal had been ripping open trash bags and acting aggressively toward nearby dogs. Soon after she arrived, Sanders revved his engine and nodded at Hillary as she revved back. Both cars then lurched forward, successfully trapping the coyote between their bumpers, where it remained until help arrived. It was a heartening display of the type of cooperation that’s essential in today’s highly divided political landscape. Teamwork FTW! Senator Elizabeth Warren aided the effort by using a piece of raw meat to coax the coyote into place, while Hillary’s vice president pick, Tim Kaine, stepped in to keep traffic back and President Obama got animal control on the phone. Better look out, GOP, because Democrats officially have their act together! If they can keep up this kind of teamwork going forward, Hillary’s prospects in November are looking really, really strong.